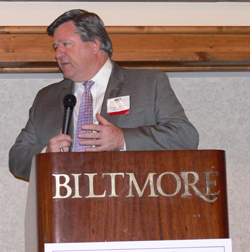 “Being a voice for business is critical work for the Asheville Chamber,” said Kit Cramer, President and CEO of the Asheville Chamber, at the annual Legislative Luncheon on April 20th. Job Creation including supporting programs that help businesses, regardless of size, to create and maintain jobs. Find more detail on the Chamber’s state and federal priorities here. 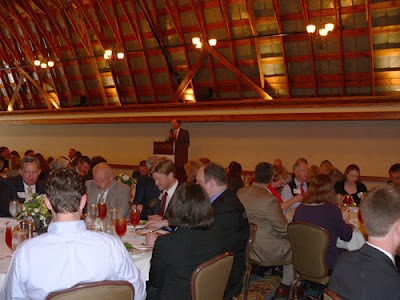 The Chamber’s legislative agenda was presented ahead of the annual legislative visit which is scheduled for May 22-23. This year the Asheville Chamber will be joined by six regional Chambers for the annual Raleigh visit. “Together we’re more powerful,” said Cramer. The event gave Chamber members an opportunity to meet and hear from the WNC state delegation who each had a turn at the mic. · “I truly believe you have a legislature focused on the priorities of business in the community,” said Senator Ralph Hise. · “I hope going forward we can continue to make NC a better place for business,” said Senator Tom Apodaca. · “We are a fiscally strong state,” said Senator Martin Nesbitt, Jr., noting stability, quality of life and ability to educate workforce as strong points for our region. · “In order to build the workforce that we’ll need for our small, medium and large businesses, we’re going to have to have quality schools," said Representative Susan Fisher. 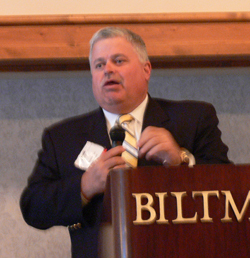 · Representative Chuck McGrady noted quality of life is key for our area in attracting businesses such as New Belgium. 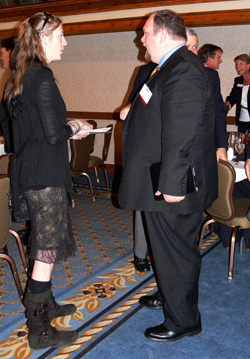 Read coverage of the event in the Asheville Citizen-Times and Mountain Xpress. The Chamber is pleased to recognize Entrepreneur of the Month John Miles of integritive for being a critical piece of building the entrepreneurial scene in Asheville. John launched integritive in 2001 as an Asheville firm specializing in integrated online strategies which includes web design and development, strategic planning, social media and e-marketing. Since then, the company has grown to 24 living wage certified jobs with local and global clients including The Grove Park Inn Resort & Spa, Mission Health and the Asheville Regional Airport locally and, on a global scale, long-standing client blues legend Taj Mahal. John has infused values into every aspect of the company, starting with the name: “‘Integritive’ comes from combining ‘integration’ (lots of services under one roof) with ‘integrity’ (an all-too-rare commodity in marketing).” But being a values-driven organization goes way beyond a name. With a company tagline of “how we do anything is how we do everything,” integritive is dedicated to sustainability (from solar web hosting and a green facility to staff commuting via alternative transportation) and has a strong commitment to service. That inclusive approach earned integritive recent recognition on the WorldBlu List of Most Democratic Workplaces alongside companies such as Groupon, Zappos.com and hulu. The WorldBlu List is a global list honoring organizations that operate according to ten principles of organizational democracy, such as transparency and accountability.